As the Ancient Egyptians built the pyramids at Giza, they developed other media for their beliefs. And some of these new media influenced world history as much as the pyramids did. 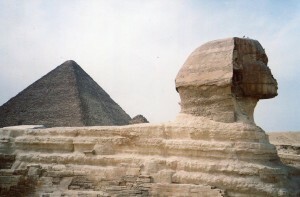 The Great Sphinx is the face of Ancient Egypt for many people around the world. Here are some facts and probablies about it. 1. We can only say probably about who built it: Khafre. The Sphinx reclines just behind one of the two temples where people docked their boats from the Nile, on the way to paying respects at Khafre’s pyramid. It presides at the beginning of the causeway that leads to his pyramid. 2. The Sphinx was carved from the natural bedrock. 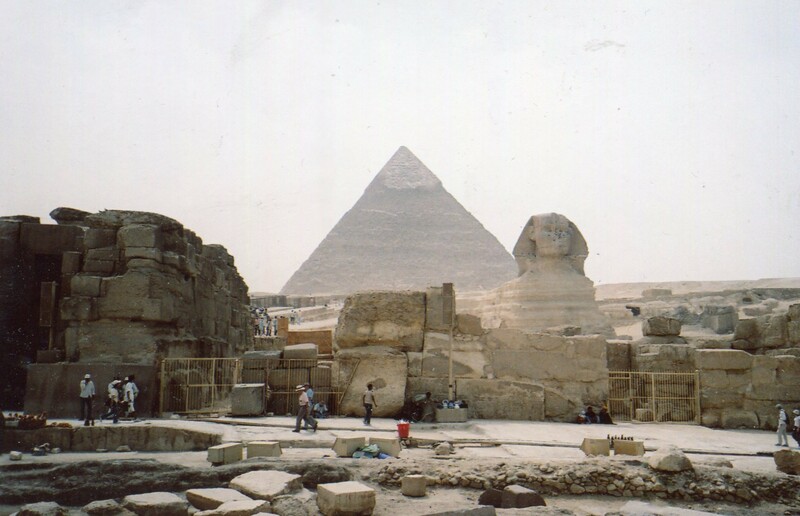 Mark Lehner wrote that core blocks of the temple that the Sphinx relaxes behind were quarried from the bedrock just below its chest. So Khafre was probably its maker. 3. Ancient Egypt associated the lion with the sun. The sun became the central cult in Khafre’s dynasty (the 4th–2575-2465BCE). It’s easy to imagine why. In the Egyptian desert, the sun’s power is overwhelming. Its blinding radiance and crushing heat matched nature’s most sublime sound: the lion’s roar. Both are golden. The lion’s mane blazes like its heavenly counterpart. 4. Ancient Egyptians also associated the lion with the king. The headdress you see on him symbolized royalty–only the pharaoh could fold his scarf like that. 5. The Sphinx is the largest of hundreds of statues that folks during Khafre’s reign made. The making of all these statues was one of the most important cultural movement during Khafre’s time. Ancient Egyptians perfected another medium for their belief system. The magnificent sun and Pharaoh were brought to down to earth and given a human form that folks could relate to. And what a form! I don’t’ think any other culture created a better mixture of power and grace. Sure the Pharaoh is strong and confident–no doubt that he could wax anyone’s behind. But the softly rounded facial features and the elegantly contoured feline body add humanity. 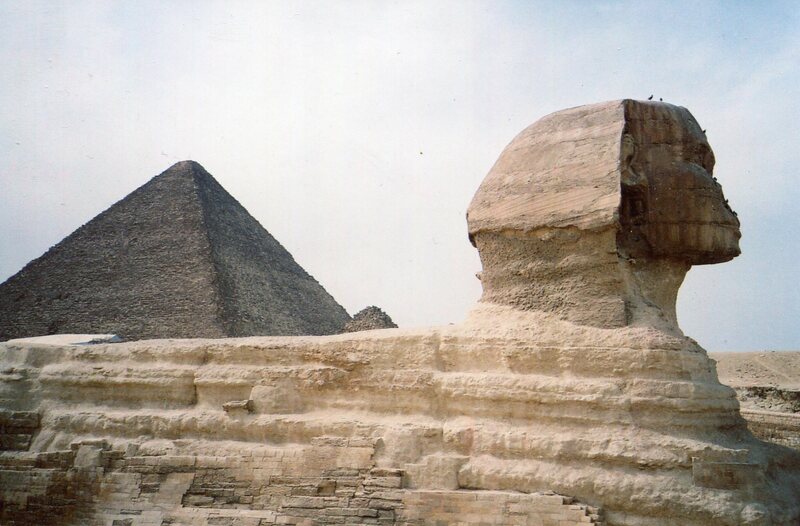 The Sphinx seems to guard the causeway to Khafre’s pyramid, but with benevolence that feels welcoming. As ancient Egyptians built the pyramids, they also created ways to express their world-view in human terms. They would continue to develop humanized art over the next century. This movement became one of the cornerstones of Western culture, and a key reason for Ancient Egypt’s appeal around the world today. The nose is not news. This blog’s articles about ancient Egypt are about the Old Kingdom–how this fascinating civilization developed and how its people thought about the world. The nose is reputed to have been destroyed much later, possibly in the 14th century, or later by Ottomans (not by Napoleon, as popular lore holds). The Sphinx and Old Kingdom Egypt are far more fascinating than this issue. Your images of Egypt make me want to visit! We were plninang a surprise 60th birthday trip for our mom last year, and then the entire uprising happened and we decided not to go. Too bad because the best time to visit was right after the crisis. I’m excited to explore Abu Dhabi this year though. Inspiring shots!